Have you ever wanted to train like a Navy Seal? Navy’s elite warriors undergo excruciating military training to defend the country and carry out the country’s interests. Therefore, you should understand that it is extremely difficult to train like a Navy Seal. There are ways and certain exercise routines you can perform at home that replicate the excruciating military training of the Navy Seals. Without beating about the bush any further, here are 3 ways to train like a Navy Seal at home. The site, Seal Grinder, has a wealth of information on the ways Navy Seals train and how they go about their business in general. 1. Pushups, pullups, sit-ups etc. If you want to train like a navy seal, you must be able to perform pushups, pullups and situps easily. And, if you are feeling extra motivated, you should also perform planks in between the sets. Being more specific, you can perform either one of the three workout routines to achieve your goals. Workout 1: For this workout, you must complete 10 sets of 20 situps, 10 pushups, and 10 pullups. However, you must also include a quarter-mile run in the between the sets. Sounds difficult, doesn’t it? Workout 2: Workout 2 involves you increasing your set after every set. For instance, if you complete 10 push ups in your first set, you should increase the count to 20 push ups in the next set. Workout 3: Workout 3 involves you getting to 100 pull ups, 300 sit ups, and 200 pushups in as little sets as possible. All of the aforementioned workout routines can be performed at home. A Navy seal has to be in top condition at all times. In order to achieve such health goals, he/she must regularly include running and ruck marching in his training regimen. 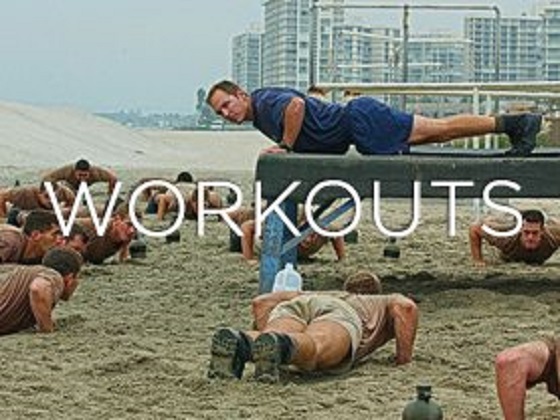 And, if you want to train like a Navy Seal, you should too! Of course, you can take a break in between your running and marching; however, in your breaks, you should do calisthenics and squats. In order to qualify to become a Navy Seal, one needs to do a 500-yard swim in less than 9 minutes. Hence, you need to pay a close attention to your swimming too. You must put in the time if you intend to train like a Navy Seal. You must be consistent with your training routine and see to it that you complete your goals every day. Navy Seal trainees usually train 9 hours a day to prepare themselves. This may be impossible for you if you aren’t someone who can be considered a fitness freak. In such cases, you can start small and work out for an hour or so before switching it up as your fitness level progresses. Consistency is the key to success and you must perform your exercise routines even when you least feel like doing it. After performing all the exercises throughout the week, you can take a rest day on Sunday.